Hahn (elbow) will likely remain at the Royals' spring training facility after camp concludes and could be on the injured list until June, Jeffrey Flanagan of MLB.com reports. The delayed start to Hahn's season doesn't come as a major surprise after he required surgery in August to repair the UCL in his right elbow. 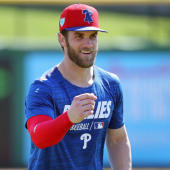 While his procedure wasn't quite on the same level of a Tommy John surgery, it nonetheless requires a rehab period of several months and will put him well behind his fellow pitchers this spring. Hahn should still be able to begin some sort of throwing schedule during camp and could be ready to head out on a minor-league rehab assignment in May.